After almost eighty years, the banquet hall of the Ohrada hunting lodge has its original decorations back. 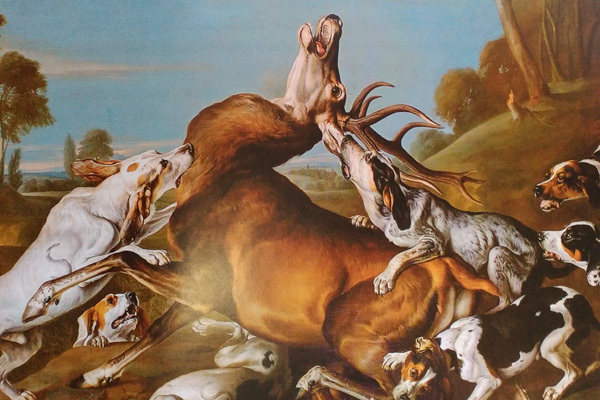 The decorations in question are paintings of hunts, rare canvases of Viennese painter Johann Georg de Hamilton. Thanks to the cooperation of the National Heritage Institute, the pictures have been returned to their former places, at least by way of copies placed in the original frames. It is unusual for an architect to design the layout of a room according to the size of paintings when designing a building. But this was the case with Ohrada. During the design phase of the hunting lodge project, Prince Adam Franz of Schwarzenberg was already anticipating that large-format canvases of hunts would be hung in the building’s main hall and had the dimensions of the walls adapted. In the year 1706, Prince Adam Franz of Schwarzenberg invited Viennese painter Johann Georg de Hamilton (1672-1737) to his estate in Hluboká nad Vltavou and commissioned him to paint ten large oil paintings with hunting motifs. For more than a decade, with his very own precision, Hamilton attempted to fulfil the assigned task as to perfection. He participated in hunts, devoted himself to observing animals during chases, and had killed animals brought to him to use as models, even from as far away as Russia and Poland. The paintings then hung in the hall for over two hundred years. For the sake of security, shortly before the occupation of the borderlands by the Third Reich in late September 1938, Adolf Schwarzenberg decided to have the extremely valuable paintings moved to safety. They travelled all the way to Canada and after the Second World War, were lent to a museum in Austria. Ten years ago, workers of the National Heritage Institute successfully ascertained that the canvases were on display in Stainz castle and Murau castle in Styria, Austria. After a series of negotiations with the current owners, Ludmila Ourodová obtained the consent of the National Heritage Institute to have copies made. These could then take the places of the original canvases. The copies hang in the original, today restored, frames, which could not be taken away together with the paintings due to their size, and so spent years hidden away in the lodge’s attic. The return of the canvases to the Ohrada hunting lodge is a momentous occasion, as they are an inseparable part of its interior. We give our thanks to the Heritage Institute, without whose efforts and negotiations, the copies would never have been made. This year, the National Museum of Agriculture is celebrating the one-hundredth anniversary of its foundation, and the return of Hamilton’s canvases is one of the “presents” which we have prepared for you as part of the celebrations. The copies of Hamilton’s canvases have been on display at Ohrada during the museum’s opening hours.